Please e-mail a flyer, that will be posted in our front lobby, with a photo, contact information and as much descriptive information as possible. Also see our Lost & Found album on our Facebook page (to post a Lost or Found flyer on our Facebook and Twitter please email the flyer or send it via a Facebook message). Create a flyer online via Helping Lost Pets! Some ideas to find your lost pet! Animals are lost every day in San Antonio. In one moment, a small hole in the fence, a gate left open, or even a thief can cause a family to lose their beloved pet. Here are a couple ways to hopefully recover your four-legged loved one. First and most importantly, microchipping your pet can greatly increase their chances of being returned to you. Be sure to microchip your animal and make sure you follow the proper procedures necessary. The San Antonio Humane Society offers microchip implantation and registration for only $25. Second, putting up signs and flyers is a good way for people to be on the lookout and recognize your pet, should it wander past them. The San Antonio Humane Society has a large bulletin board specifically for lost and found postings. Please e-mail your flyer or bring it to the front desk, and a SAHS staff member will happily place it on the board for you, as well as reserve a copy in the Lost & Found records kept at the front desk. To reclaim your animal from the San Antonio Humane Society, there is a $50 reclaim fee and a fee of $10 per day for boarding. Please call 210-226-7461 for more information. Please contact Animal Care Services (ACS) in case your animal has been picked up or dropped off at their facility. Visit the sites below, plus more places to look and post. 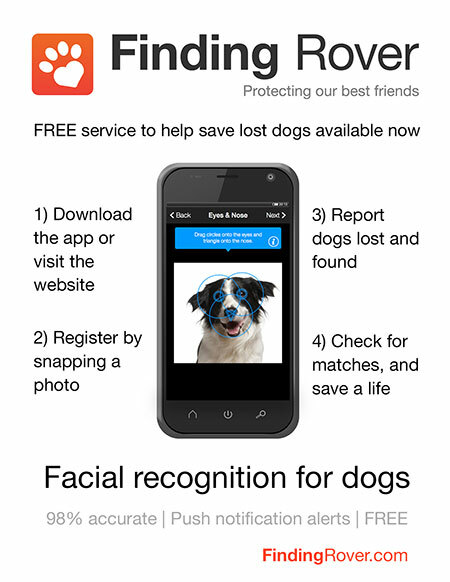 The SAHS has partnered with Finding Rover, who created an app that uses facial recognition for reconnecting lost dogs with their owners. With approximately 150,000 stray pets on the streets of San Antonio, the SAHS hopes to help reconnect more pets with their owners with the help of the Finding Rover app, which touts a 98% accuracy rate. Furthermore, pets who get adopted from the SAHS, their new families will have the opportunity to sign up for notifications in the event their pet is lost. After a pet is brought into the SAHS shelter, it is automatically uploaded into the Finding Rover database. Finding Rover is a free app that is easy to use. Once the photo and some basic information is uploaded about the dog, users can report their dog as missing and report missing dogs that they found. While there is not an option for cats, Finding Rover is working on that resource.